I don't know why I'm spending my lunches waxing rhapsodically about beets and the farmers that grow them, but here I go again. You know that when you get beets you should eat the greens pretty quickly, but the beets themselves will hang out in your fridge for a while. You can shred and freeze them for later use, you can roast them and put them on or in a pizza, or you can make a tasty appetizer. What I recently learned was that you can also love them raw. All thanks to Martha. Even though I work at a thrift shop, I'm still pretty frugal about shopping there. I always check the clearance section when I get to work, and rarely scan the racks (oh who am I kidding--I check out the kitchen section all. the. time). Whenever I see good magazines in the clearance rack, I snap them up. I mean, it's the same thing year after year; people always want to declutter their space and find new crock pot or grill recipes. Only the trendy colors and vegetables (talking 'bout you, kale) change. This is why I bought a couple of old issues of Martha Stewart Living--I figured I could find an idea or two for seasonal foods. 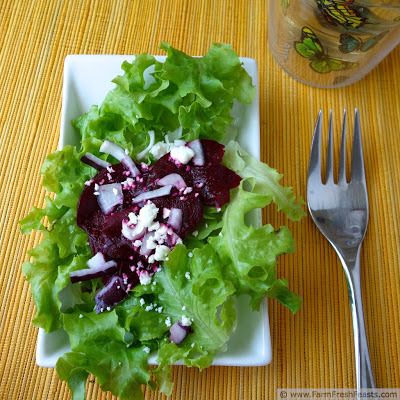 Late one night, while reading the March 1998 issue in between an article about building your own stone wall and an article about ordering seeds and bulbs from foreign catalogs, I read about shaving raw beets and tossing them with a balsamic vinaigrette. The next morning I dutifully carried down the March 2004 issue and prepared to follow the recipe. (Did you notice it was a different issue? You're doing better than me. I thought I'd hallucinated the whole balsamic-marinated shaved beet thing. What, you don't hallucinate about shaving beets? What do you hallucinate about?) Because I was feeling lazy, I didn't walk back upstairs to get the correct year, I just winged it. Then I winged it again the next day since it was so good. This is easy, this is delicious, this is raw . . . give it a try. The worst that will happen is your kitchen will look like an abattoir. I've got a dark counter so I have no idea how bad it really could look. You know, I don't even think I'm going to write up the recipe much--it's so easy. 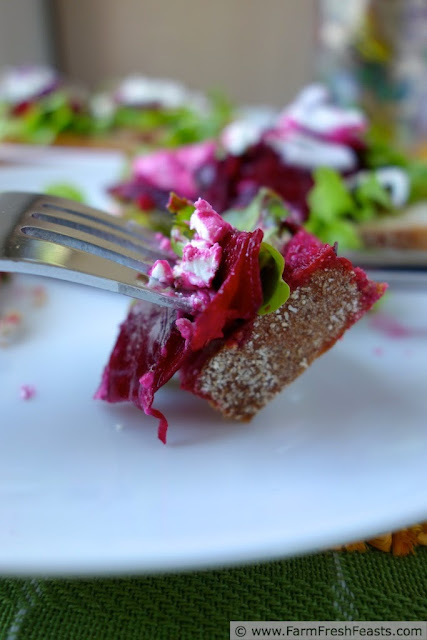 Take a beet, peel it, grab a Benriner or mandolin or sharp knife and make wafer-thin slices. Place in a bowl. Toss with a tablespoon or so of balsamic vinaigrette, sprinkle with a pinch of salt and a few grinds of pepper, and set aside for 15-20 minutes at room temperature. 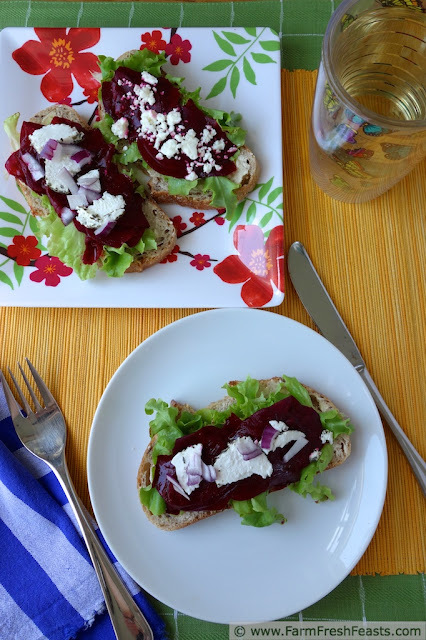 Make an open-faced sandwich by layering buttered bread with greens, beets, and cheese. Eat with a knife and fork. Also good without the bread, over greens as a salad, topped with a bit of red onion and cheese. This post joins the party with the Clever Chicks Blog Hop, Tasty Tuesdays, the Wednesday Fresh Foods Link Up, What's Cookin' Wednesday, the From The Farm Blog Hop, What I am Eating, What's In The Box, and Mostly Homemade Mondays, Food On Friday Twice. I've only recently tried raw beets, and what a revelation! The flavor is delicious, and if you marinate them for a few minutes in a nice vinaigrette, they're even more delicious. Love the idea of these open-faced sandwiches. Messy to prepare (I'd use the thin slicing blade in my food processor) but really a wow to serve. I used my Benriner since I only did 1 beet at a time, and cleaning that is so much faster than my food processor, but you're right--if I had more beets to do, containing the mess in the food processor would be the way to go. I'm blown away by how much this spring/early summer has turned into a Beet Spring for me. I love all things beet. I have not tried them raw yet. And I just happen to have a dozen small beets I picked up yesterday at the farm stand. Going to get out the mandolin! And then roast the rest of them. Yum! Yum and double yum! I keep trying to roast the bundle of tiny radishes I got, but they keep ending up in salads and sandwiches before I get to the oven. They are just so cute! I hope you have more success with your beets. Kirsten, I just found your blog on Foodie Blogroll, and as a fellow CSA blogger I love it! This recipe looks great and I love how you went back to old magazines for it! I look forward to trying this and reading more. Hey, FoodieBlogroll is good for something! Who knew? I hope you check out the CSA-loving link ups (the Wednesday Fresh Foods Link Up at Gastronomical Sovereignty and Thursday's What's In The Box at In Her Chucks), I'd love to see you there. I love to drink my beets. I can't help myself; there is something intoxicating about beet juice and it's highly likely the three beets in my fridge right now will go down the same way. I will try to set one aside though and make this dish, just for you. After all, you gave it such a good review; it's the least I could do. Thanks to you I learned of the romance between beets and oranges that happens in my Vitamix, but you gotta try just one tiny beet this way. It's really yummy! I'm trying to make an acceptable beet version of Red Velvet cookies, but haven't quite made it yet. 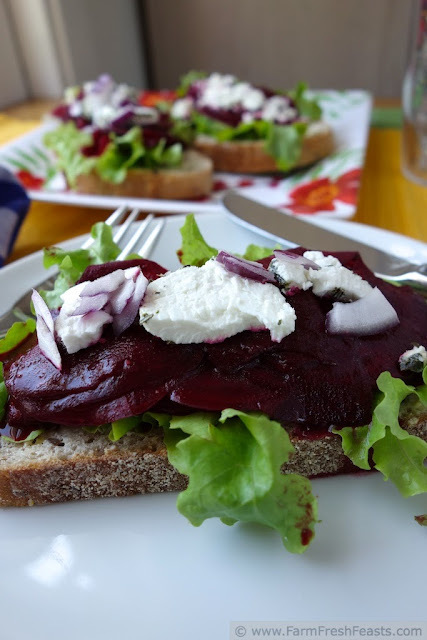 And I won't, if I keep making yummy savory dishes with my farm share beets! Thank you for not calling me a hoarder. For the record, I had the magazine in my house for, oh, maybe a week or two before I found the recipe. (And it's still here--I will recycle it soon though!). Yes, it is. I'm amazed at how much my Benriner can do and how it broadens my veggie repertoire, and quite glad Alanna at A Veggie Venture suggested I look for one at my local Asian market. Oooh, I have exactly one large beet in the garden ready to pull, so I think this is going to be dinner tonight! Thanks for the inspiration! Luckiest1, you are indeed lucky to have a beet in the garden! I wish I knew what's growing in my garden. I mean, I know all of the things that I planted, or my Dad planted during his visit, that are growing in the garden. But there's a new batch of mystery squash growing, and I look forward to figuring out what it is. Then figuring out what to do with it! I'm honored--I hope your kitchen wasn't too messy with the bleeding red beet! I am not a beetroot eater. My husband LOVES it. It's one of our classic veggie arguments, but when I fee like a softie, I always make him some. Next time, I'll use this recipe for him because it looks absolutely beautiful! :) Thank you so much for linking up with me this week at Tasty Tuesdays! I’ve pinned this & shared it with my followers! Please be sure to stop back by the party and check out some of the other links! That is an act of love, to fix food you don't care for, for the one you love. Way to honor the one you love! My daughter brought home a bunch of beets from her summer gardening project--beet greens were the first order of business, and you know what's next.